This was the main course in the dinner I cooked for my husband and I this past weekend (posts on the first course can be found here, second course here) and it was my favorite part of the meal. 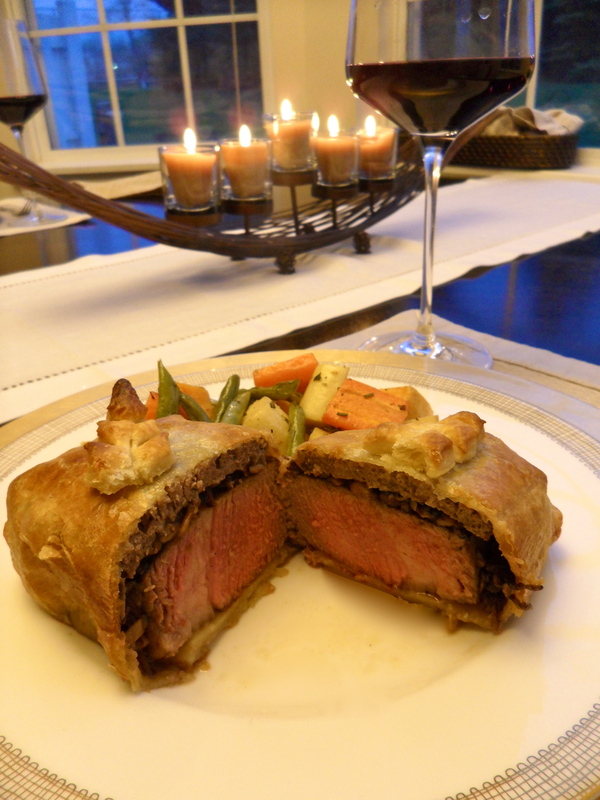 Beef Wellington is traditionally a 2-4lb beef tenderloin encased in pastry and served in slices, but since it was just for the two of us I decided to make individual wellgintons. The perfect portions of filet mignon topped with Pâté de Campagne and mushroom duxelles and wrapped in a buttery puff pastry have my mouth watering just typing this post. Add to that an amazing combination of root vegetables seasoned with fresh herbs and roasted to perfection and this is such a great meal for a dinner party. Again, this dinner was just for my husband and I so it yields 2 servings but can easily be multiplied to accommodate more guests. Preheat your oven to 425 degrees. Start by taking two (6 ounce each) filet mignons out of the refrigerator and allow them to come to room temperature (about 20 minutes). Most people overlook this step when cooking steaks and it really is a necessity if you want that amazing sear on them. When looking for your filets, you want ones with good marbling and are about 1 1/2 inches thick. If your steaks are smaller, you may have to adjust the cook time… ours were prepared medium. While the steaks are coming to room temperature, start on the vegetables. 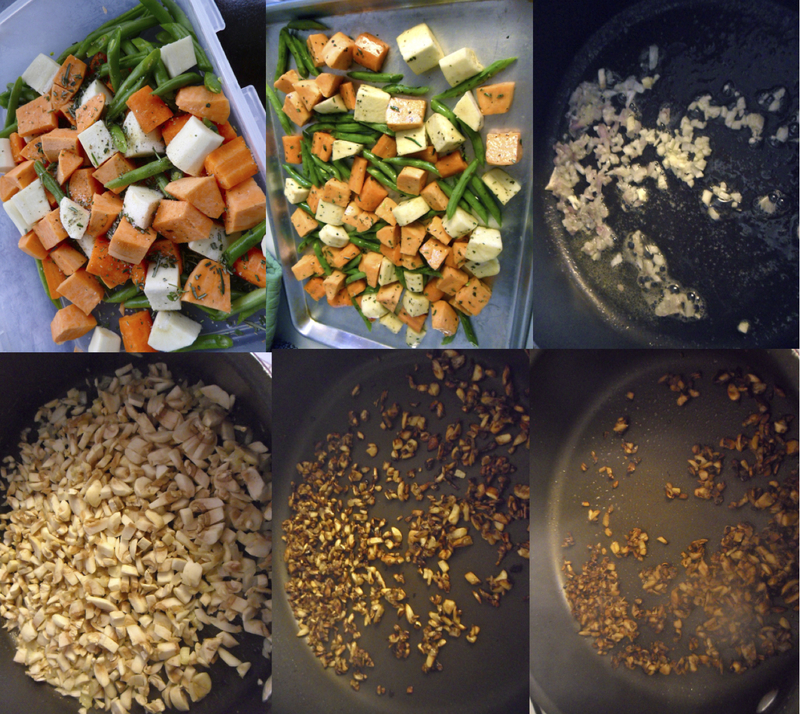 Cut 2 medium carrots (peeled), 3/4 cup frenched green beans, 1 large parsnip (peeled) and 1 large sweet potato (peeled) into bite sized chunks. Toss with 1/2 tbsp fired oregano, 1/2 tbsp fresh rosemary (chopped), 1/2 tsp fresh thyme (chopped), 1 tsp fresh basil (chopped), 1/4 tsp sea salt and 1 tbsp fresh ground pepper. Arrange on a baking sheet and drizzle with about 3 tbsp extra virgin olive oil. Place in the oven and set the time for 40 minutes. (You should be able to time it up so that by the time you prepare the steaks and get them in the oven, they both with finish at the same time). 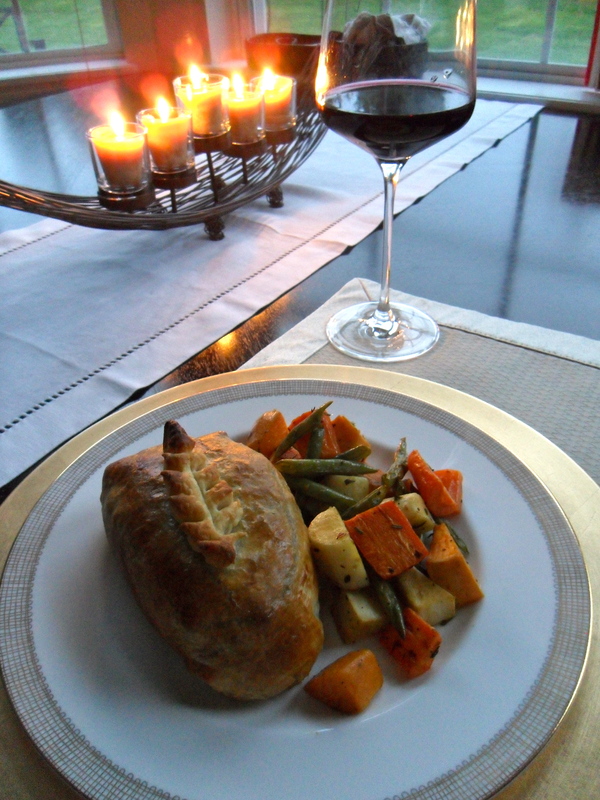 While the vegetables are roasting, you can start assembling your beef wellingtons. Start by making the mushroom duxelles. Heat 1 tbsp unsalted butter in a medium skillet over medium-high heat. Add in 2 tbsp minced shallots and 1 small minced clove of garlic. Stir until fragrant, about 30 seconds. Add in 8 ounces finely chopped button mushrooms. Season with salt and pepper, reduce the heat to medium and cook for about 12 minutes, until the mushrooms start to caramelize. Deglaze the pan with2 tbsp dry white wine (I used a Sancerre from our first course) and stir until all the liquid has evaporated. Remove from heat and let cool before using. Next, prepare your puff pastry. You’ll need about 2/3 of one sheet of defrosted frozen puff pastry. 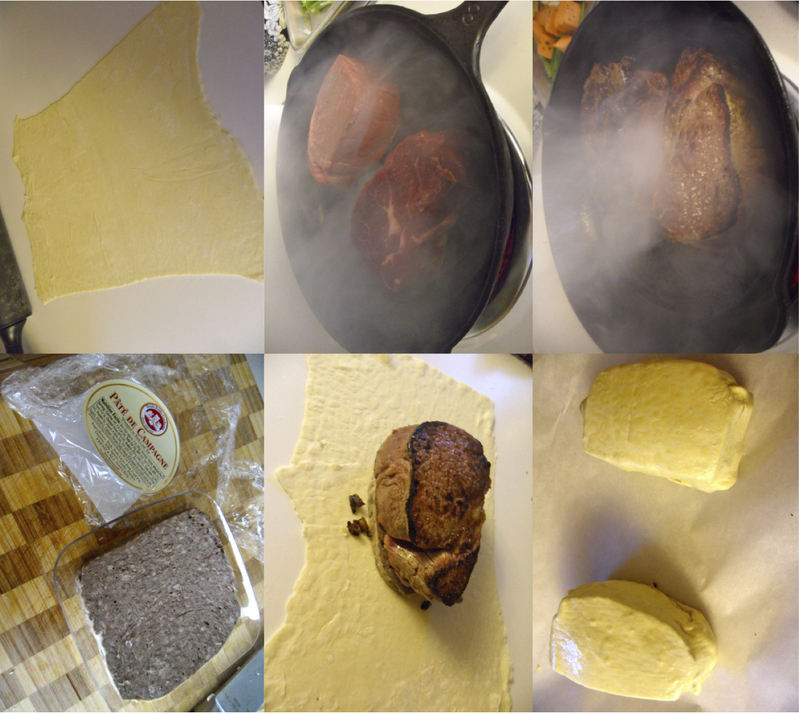 Roll it out until it is very thin, you just want a thin layer of pastry encasing your filet. Now you’ll need to get a good sear on the outside of your filets before they go in the pastry and into the oven. Get a cast iron skillet as hot as you can with about 1/s tbsp extra virgin olive oil (if you remember from my post on restaurant steaks, this will produce A LOT of smoke so you may want to do this part outside). Season your filets well with salt and pepper, on both sides, and add the filets into the skillet. Sear for one minute on each side and then remove from the skillet. Start building the beef wellingtons. Cut your puff pastry into two equal pieces and on each place a slice of Pâté de Campagne (you can also use duck pâté) that is the same size as your steak. Our grocery store sells the pâté in small slices so all I had to do was slice it in half horizontally and then trim to the size of our filets. Top each slice of pâté with half the mushroom duxelles and then the filets. Wrap the filets with the puff pastry as you would a present and press to seal the edges. Place the wrapped filets, seam side down, on a parchment lined baking sheet. Beat one egg with a splash of water to create an egg wash and brush the outside of the pastry lightly. You can cut out a shape with the extra puff pastry to add some decoration to the beef wellingtons or you can leave them plain. Bake in the oven for 20 minutes. The steaks will need to rest for about 10 minutes before serving and after 40 minutes total, the vegetables should be ready. I served this course with a 2011 Georges Deboeuf Beaujolais Nouveau.